London shows for just £10 in the New Year | Fourthwall Magazine & The Drama Student – The magazine for careers in the performing arts – actors, drama students, directors, producers, writers, production crew. Over 45 theatres sign up to the scheme that offers tickets at a fraction of the normal cost. Official London Theatre have launched their annual ticket scheme to get everyone to the theatre. The public are invited to see some of the best shows in London for a fraction of the normal cost. Over 45 theatres in the capital have signed up and will be offering tickets from just £10. From plays to musicals, children’s entertainment to ballet, the magic of theatre will come alive across London from 1st January to 13th February 2014. The list includes remarkable shows such as long-running West End hits Jersey Boys, Mamma Mia! 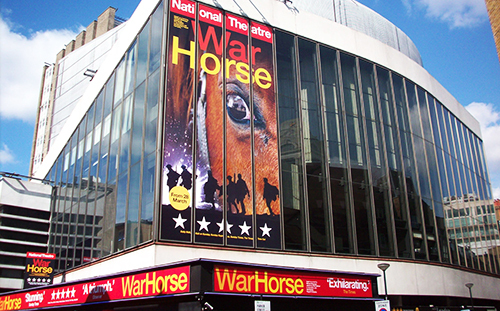 and War Horse, alongside newcomers Stephen Ward, The Commitments and From Here to Eternity. Fans of dance can enjoy Swan Lake or The Snowman, plus there are lots of family-friendly shows taking part such as Horrible Histories: Barmy Britain Part Two!, The Gruffalo and Disney’s The Lion King. It’s not just West End theatres but a range of venues across the capital have signed up to the promotion including the Old Vic, New Wimbledon, Sadler’s Wells and the Barbican. Get Into London Theatre tickets go on sale on 10 December 2013, with tickets available to book online at www.getintolondontheatre.co.uk or via the Ticket Hotline: 0844 581 5050. The Ticket Factory is the ticketing partner for the promotion and, as in previous years, there are no postage charges or booking fees payable on tickets purchased.